Well-documented, I love a good dessert (especially one that involves chocolate. Or coconut. Or maybe both). 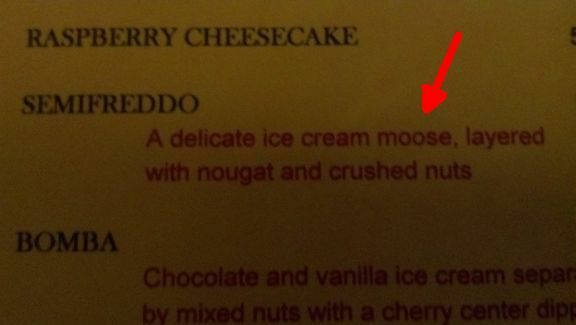 But one thing I will not be ordering is ice cream moose. Okay, so here’s the deal. When you order “a molded chilled dessert made with sweetened and flavored whipped cream or egg whites and gelatin” (M-W), you are hoping for a delicious mousse. If instead the waiter brings you “a ruminant mammal (Alces alces) with humped shoulders, long legs, and broadly palmated antlers ” (M-W), he has brought you a moose, which, unless it’s actually made of ice cream, is not likely to be that satisfying, you know, dessert-wise. Menus are great places for finding errors of a similar elk. Oh, deer. I gnu something was wrong.